Keloids are raised scars that have expanded beyond the boundaries of the original wound. Like all scars they are composed primarily of collagen and are benign. They can, however, become painful, itchy, or be cosmetically concerning. The cause behind keloid formation is not well understood, but they are thought to have a genetic component – a person is more likely to develop keloids if his or her family members have a history of keloid formation. Keloids occur much more frequently in people with darker skin tones and are more common in people aged 10 to 30. Treating a keloid is difficult because they have a high rate of reoccurrence. The most successful treatments involve using two or more of the possible options in combination to achieve maximum effectiveness. 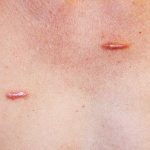 Some of the most common treatments for keloids include compression therapy, steroid injections, surgery to remove the keloid, radiation, using liquid nitrogen to freeze it, and laser therapy. The most important “treatment” for anyone with a history of keloid formation is prevention. If you or any close relatives have a history of keloids it is important to avoid trauma to the skin whenever possible – do not pierce you ears, be careful when shaving, and inform your physician of your history prior to any surgery or medical procedure.